HGTV lined up all six Brady kids in front of their iconic television home (well, the LA property that served as the exterior shot) to kickoff the network's upcoming series, "A Very Brady Renovation." You may remember the network bought the Brady Bunch house earlier this year, outbidding N' Sync's Lance Bass. Now, it plans to restore the iconic home to its "full, resplendent, unabashedly ‘70s grandeur," according to a blog post. So, here’s the story. (Surely you didn’t think we’d pass up the opportunity to use that line.) Back in August, HGTV officially became the proud new owners of that quintessentially suburban split-level ranch seen in virtually every episode of The Brady Bunch. And you can rest assured that, with its penchant for magical, mind-blowing home makeovers, the network has some very special things in mind for this particular home transformation. It’s all part of — and will be documented in — a new series, A Very Brady Renovation (w.t. ), scheduled to air on HGTV in September of 2019. And we suspect that even the most ardent Brady Bunch enthusiasts and purists will not be disappointed. 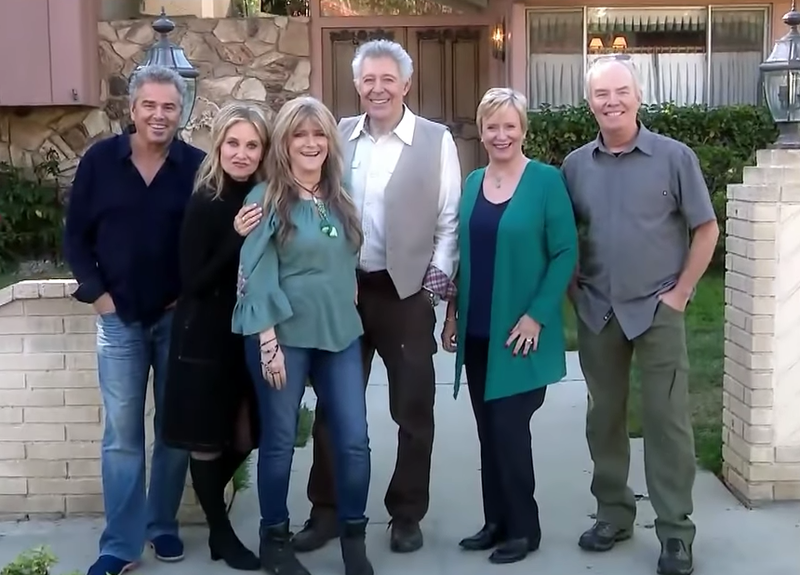 ...For the first time in 14 years, all six siblings from the show’s original cast were reunited as they joined up with some of HGTV’s most well-known on-air talent. It was all part of an event to announce plans for the renovation and the accompanying series. TV siblings Barry Williams (Greg), Maureen McCormick (Marcia), Christopher Knight (Peter), Eve Plumb (Jan), Mike Lookinland (Bobby) and Susan Olsen (Cindy) gathered with Jonathan and Drew Scott (Property Brothers), Mina Starsiak and Karen E Laine (Good Bones), siblings Leanne and Steve Ford (Restored by the Fords), Jasmine Roth (Hidden Potential) and Lara Spencer (Flea Market Flip) for an on-camera walk-through of the home.